Luggage handles are more important than most of us realize. Usually we only realize how important they are when they breakdown. Suitcase handles are not only for wheeling your luggage around, the handles make all luggage handling easier. Can you imagine how awkward and difficult it would be to lift big heavy suitcase without handles? How would you maneuver your bag around busy airports and up and down stairs? How would you lift it at the check-in counter or fit it into the overhead locker? Still most of us pay little attention to the quality of handles when we buy our luggage. This article explains what to have in mind when evaluating the quality of your luggage handles. What Is Telescoping Luggage Handle? When reading through wheeled luggage product descriptions you will soon come across telescoping handles but what exactly does it mean? Telescoping luggage suitcases have extendable handle (think of a telescope) allowing you to wheel the bag around. It is as simple as that. Most telescoping handle suitcases can be extended to different lengths (at least two) and lock firmly in place. It is important to make sure the maximum luggage handle extension is suitable for your height, i.e. to minimize the strain on your back when wheeling your luggage around. This is especially important for tall people though you can buy luggage handle extensions. The best telescoping luggage handles are rigid, lock firmly in place and come with single control button, allowing you to operate your wheeled luggage with only one hand. What Is Ergonomic Luggage Handle? Ergonomic means equipment that is designed to minimize physical effort and discomfort. Ergonomic luggage handles are therefore designed to make wheeling luggage as efficient and easy as possible. Ergonomic handles allow you to push or pull your luggage (just like spinner) and to rotate the luggage 360 degrees for maximum comfort, reducing shoulder, elbow and wrist strain. There is luggage that comes with ergonomic luggage handle system but you can also buy special ergonomic luggage handle to add to any suitcase. 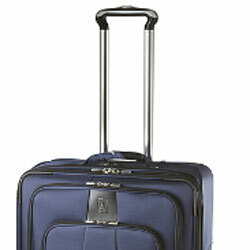 Wheeled luggage is very popular as it makes it so much easier to maneuver around. The luggage handle system however adds to the weight of the luggage piece and can reduce the packing space available. Having the luggage handle system outside is cheaper solution and does not affect the internal packing space. However, outside suitcase handles are more vulnerable to damage to the handle mechanism. Good quality is therefore essential if opting for external handle system. Inside luggage handle systems are less vulnerable but often reduce the inside packing space. Quality luggage brands solve this by providing flat surface on the inside of the bag. Flat handles also take less from the interior space. The wheeling luggage handling system is not the only thing that matters. Your luggage should also have easy carry handles on the top and side of the bag, allowing you to lift the bag whichever way you prefer. Good carry-on luggage also has carry handle at the bottom of the bag to make it easier to lift it into the overhead compartment. Quality telescoping luggage handles are rigid, lock firmly in place and can be operated with one hand only. While handles for lifting the bag must be able to sustain the full weight of a loaded bag. They should be adequately fastened in order to minimize the risk of tearing / breaking the handles off the bag. When buying luggage on-line, check the product photos carefully for details and read the luggage reviews. Using Ctrl-F (windows) or Option-F (macintosh) on a website page allows you to search for all mentions of 'handles' on that page (or anything else you want to look for).